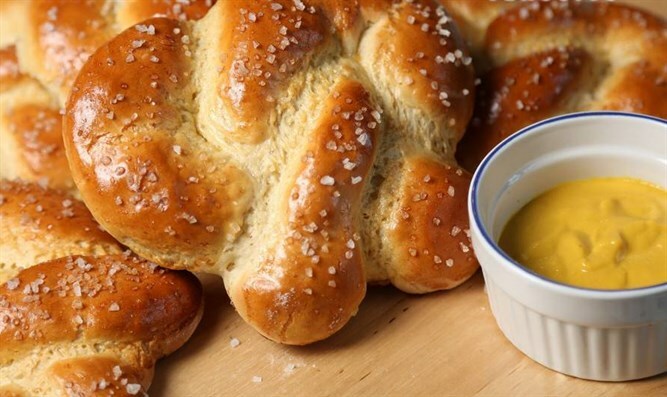 With a crispy outside and chewy inside, hot pretzels are the perfect snack. Dissolve yeast in orange juice or water and add to flour. Add sugar, oil and salt. Knead to form smooth and elastic dough. Place in greased bowl, turning once. Let rise until double in size, about one and a half hours. Punch down. Place dough onto lightly floured surface. Cover and set aside for 10 minutes. Roll into a 12- by eight-inch rectangle. Cut into 16 strips. Roll each strand to 16 inches long. Shape into pretzels. Let rise, uncovered, for 20 minutes. Fill a large pot with two quarts water and bring to a boil. Dissolve salt in boiling water. Drop three to four pretzels into water. Cook for two minutes, turning once. Remove with slotted spoon. Drain on paper towel. Place half an inch apart on a well-greased baking sheet. Brush with egg white and sprinkle with sesame seeds or coarse salt. Bake at 350 degrees Fahrenheit for 20–30 minutes.